Adjacent to the ruins of the manor house built by Sir Baptist Hicks stands The Court, at the end of Calf Lane. Behind it, beyond the garden, are other buildings including the ‘Coach House’ and the archway leading to Lady Juliana’s Gate. As yet no definitive history of these buildings has been established and the following suggestions are therefore based on observations, such historical and archaeological work as has been done, local traditions – and personal suppositions. 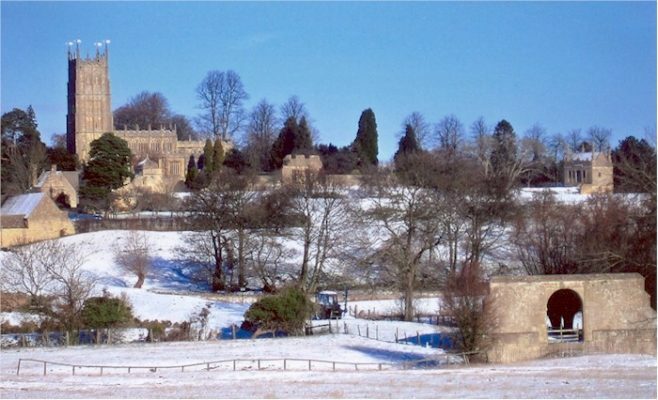 The manor of Campden was once held by King Harold, but the centre was then in the village now known as Broad Campden. It was not until the granting of the first Market Charter by King Henry II in the late twelfth century that the High Street was laid out. This is presumably the earliest time when a church and a manor house might have been erected at Berrington. Could either or both date back as early as this? As yet there is no information. However King Henry II did visit Chipping Campden in 1185 and King John in 1215. It must be assumed that on each royal occasion some suitable place must have existed for their accommodation and worship. By the time later mediaeval kings came here there can be no doubt that there would have been received in a building illustrative of the high standing of their host. The most recent Manor House was built after his purchase of the manor in or a little after 1608 by Sir Baptist Hicks and was burnt down in 1645. No evidence, archaeological or documentary, has yet been found to suggest that there was any earlier building on that site. Indeed it seems highly likely that this splendid edifice was located where it was, in accordance with the very latest fashion in house and garden design. That there was an earlier manor house in the vicinity is certain. Not only had earlier lords of the manor, including Sir Thomas Smith, lived here, but there is circumstantial evidence. When, in 1605, thieves attempted to steal bell-metal from the church, and were repulsed, by local guardians, they fled into the nearby manor house. Antony Smith, then lord of the manor, refused to hand them over to the Town Constable. What happened to the old house? It might be supposed that since it was not on the site chosen by Sir Baptist for his edifice, it remained. He may well have stayed in it on his visits to Campden to view his new property and to oversee the work on his own new house. Once that was completed he would of course have moved in. Would the old manor house have then been demolished? Sir Baptist was hardly the man to destroy something that might continue to be of some use. In addition other buildings connected with the estate are located close by, some may well have preceded the death of Sir Thomas Smith. Most, perhaps all, have had significant alterations over the years (eg the dovecote) and some could well have been improved by Sir Baptist (eg the stone slated roof to the ‘Coach House’). Local tradition has it that after the burning of the great house, the stables were converted for the Dowager Lady Juliana Noel. But what if the previous manor house had been retained for a less prestigious use by Sir Baptist? This would provide a fine start for any redevelopment. Could The Court therefore incorporate the remains of far more than the old stables? Was it perhaps the residence of Sir Baptist’s senior servants and his estate manager? He continued after all to spend much time in London and would have expected things to have been managed during his absences. Could it be that this was the dwelling of Lady Juliana’s estate steward during the Commonwealth and at the time of the Restoration? Certain points in the tale of the Campden Wonder indicate that this house was lived in in August 1660. What evidence can be gleaned from the building? Towards the left side of the façade the wall seems fully erect and there is a sealed up doorway that looks to be original. On the right hand side the upper art of the wall is curved and somewhat cracked, as if it covers part of a warped timber frame. The suggestion that this is entirely due to an accidental warping of the internal floorboards though spillage from a water-tank in Victorian times, seems inadequate to explain the curvature. Along the entire foot of the wall, apart from the doorways, runs a line of stones. These provide a feeling that this is a single building, but has it always been so? Was it added with the stones of the façade in order to unify the structure? The rear of the house, visible from the garden, had two interesting buttresses. All this raises the possibility that The Court is on (or close to) the site of the earlier manor house and that some remains or indication may still survive. Perhaps also it incorporates some part of an earlier structure – not necessarily on that site but the materials, timbers etc, might have been reused.